Lamiflex PP – used to protect a wide range of products. Material with Polypropylene is used to protect a wide range of products. 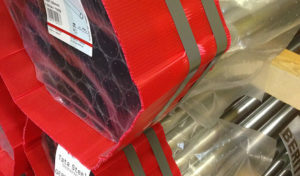 Lamiflex PP can be used for protecting products such as long goods, rolls, reels etc. when a lesser degree of industrial protection is acceptable. Additionally, Lamiflex PP can be punched, printed, and/or creased and is water and dust resistant. There are a wide variety of colors ranging from natural, yellow, red, green, blue or black, as well as, thicknesses that differ from 1,5mm to 4mm and weights that differ from 200 grams to 800 grams. Other dimensions and colors are possible by special order. Lamiflex PP can be used for protecting products such as long goods, rolls etc. Thicknesses - from 1,5mm to 4mm. Weights - from 200g to 800g.